No one played the part of pirate better than Blackbeard. [S]o our Heroe, Captain Teach, assumed the Cognomen of Black-beard, from that large Quantity of Hair, which, like a frightful Meteor, covered his whole Face, and frightened America more than any Comet that has appeared there a long Time. This Beard was black, which he suffered to grow of an extravagant Length; as to Breadth, it came up to his Eyes; he was accustomed to twist it with Ribbons, in small Tails, . . . and turn them about his Ears: In Time of Action, he wore a Sling over his Shoulders, with three brace of Pistols, hanging in Holsters like Bandaliers; and stuck lighted Matches under his Hat, which appearing on each Side of his Face, his Eyes naturally looking fierce and wild, made him altogether such a Figure, that Imagination cannot form an Idea of a Fury, from Hell, to look more frightful. Blackbeard probably kept his real name secret. He called himself Edward Teach, which appears in some records as Thatch, Tache, or Tatch. He came, most experts say, from Bristol, a seafaring town in England. Blackbeard carried more guns and commanded more men than just about any other pirate of his day. His career was brief—only about two years—but his legends have outlasted those of more successful and long-lived pirates. 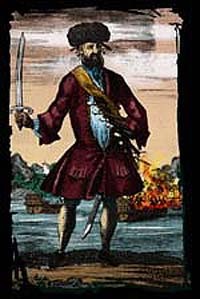 From 1716 to 1718 Blackbeard terrorized at least twenty ships from Boston to the Bahamas. He once laid siege to the city of Charleston, South Carolina, demanding medicine as a ransom. Piracy made substantial profits for individuals and governments alike in the early days of European colonization (ca. 1550–1730). Later historians dubbed this era the Golden Age of Piracy. The tricky waters of the Carolina coast, with their many islands, inlets, sandbars, and shoals, provided an ideal haven for pirates. With shallow-draft ships, pirates could easily outmaneuver the heavier warships that pursued them. Large merchant vessels often foundered in the waters of the “graveyard of the Atlantic” and became easy prey for pirates. Blackbeard hid out among the barrier islands of colonial North Carolina. When King George I offered amnesty to pirates in 1717, Blackbeard asked Governor Charles Eden for a pardon. He took up residence in Bath, Beaufort County; married sixteen-year-old Mary Ormand; and retired from piracy. But not for long. Within months, the pirate was back in business. Virginia governor Alexander Spotswood offered a reward for Blackbeard’s death or arrest in 1718. Two naval sloops commanded by Lieutenant Robert Maynard headed for Ocracoke, Hyde County, Blackbeard’s island hideout. In the fierce battle that followed, Blackbeard fell dead, pierced by more than twenty-five wounds. The victors sailed away with the pirate’s bloody head swinging from the bowsprit. It was common practice in the seventeenth and eighteenth centuries to display the head or body of an executed criminal, in hope that the grisly sight would deter observers from committing crimes. “Blackguard.” “Devil incarnate.” “Scourge of the sea.” “Piece of human trash.” “Swaggering, merciless brute.” Why does this criminal fascinate us so? Sympathy for pirates was understandable in early-1700s North Carolina. English tariffs made it difficult to profit from trade legally. Even Virginia, a fellow colony, restricted Carolina’s tobacco exports. To many a frustrated businessman or farmer, smuggling seemed a reasonable alternative. In such circumstances, one person’s villain might be another’s hero. As the Golden Age of Piracy waned, its romance began. Tales circulated through word of mouth, newspapers, songs, books, and plays. These stories interpreted the defiance of law and order as freedom from constraint. Add to this a justifiable protest against government corruption, a spirit of adventure, and a pirate’s code of honor, and you have the romance of piracy. Fictional accounts of piracy often exaggerated factual events, painting romantic pictures of pirates and their devilish deeds that have remained fixed in popular culture to this day. Even as research provides facts that challenge the stereotypes of pirate lore, people continue to tell the stories. North Carolinians identify with Blackbeard as a fellow citizen of the region. Blackbeard remains a popular symbol of North Carolina colonial history to both Tar Heels and visitors alike. 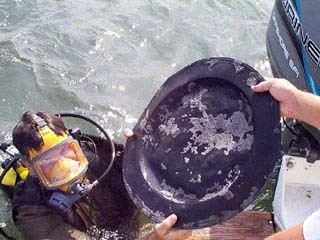 A diver retrieves a pewter platter from the Queen Anne’s Revenge underwater archaeological site. In 1996 marine archaeologists discovered the remains of a ship they believe is the Queen Anne’s Revenge, Blackbeard’s flagship that sank in 1718. Its artifacts provide intriguing information about pirate life, including what they ate, how their ships worked, the weapons they used for warfare, and what life aboard their ships was like. The discovery has sparked a renewed fascination with North Carolina’s favorite pirate. Blackbeard’s role in popular culture today is strong. 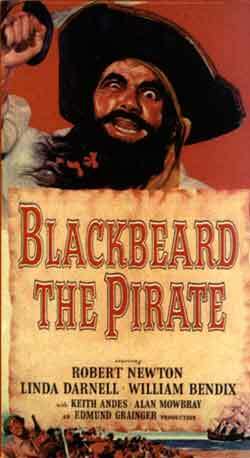 Hollywood took a shot at Edward Teach in the 1947 film Blackbeard. The movie portrayed the treacherous side of the pirate’s character and had him die at the hands of his own men. The movie is available on videotape for die-hard Blackbeard fans. Souvenirs such as key chains, tie tacks, mugs, nylon flags, and figurines promote the legends of Blackbeard. Widely available, these mementos reflect popular culture’s continued fascination with the romance of piracy. Blackbeard himself has become the foremost symbol of pirates and their adventures. Blackbeard’s infamous evil doings have spawned legends since the 1700s. Read some of them and decide for yourself if they could be true. Got a favorite Blackbeard legend that’s not included here? Share it on the Bulletin Board. Information and graphics from one of Blackbeard’s haunts, historic Beaufort. A fun interactive children’s Web site from the National Geographic Society. A Web site from the North Carolina Department of Cultural Resources Underwater Archaeology Unit offering information about Blackbeard and resources related to the Queen Anne’s Revenge excavation. 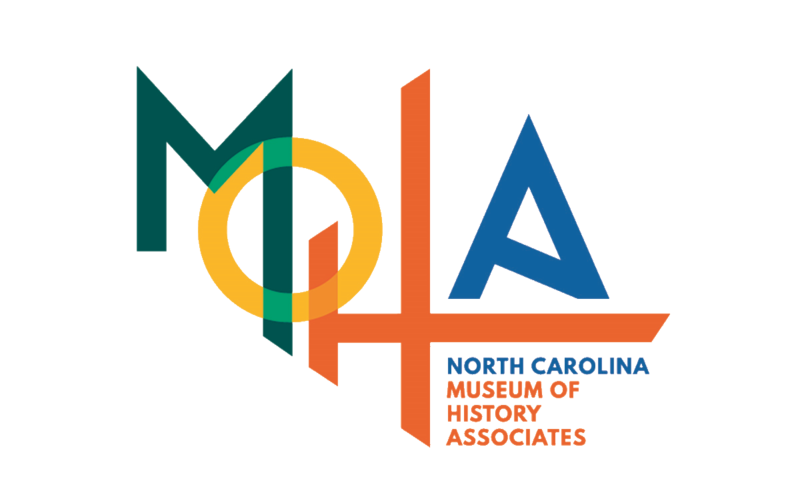 Check out this short video clip about the current archaeological discoveries being made on the Queen Anne's Revenge by WRAL's own Tar Heel Traveler, Scott Mason. This entertaining, informative Web site for students is part of the Why Files, a project founded by the National Institute for Science Education. An article from the Journal of the Colonial Williamsburg Foundation.